Professor Kopp is responsible predominantly for implementing and developing strategic aims for teacher training, developing and consolidating the degree programme portfolio, issues relating to accreditation and Master’s degree programmes for professional development. She is also responsible for digitalisation and internationalisation of teaching. Bärbel Kopp (born in 1969) studied primary education at the University of Augsburg, with German as her main teaching subject. After passing the second state examination in 1994 she worked as a teacher at the primary school in Westendorf, taking on responsibility for mentoring trainee teachers from summer 1995 until the school year 1997/98. In the winter semester 98/99 she began to study part-time for a doctoral degree in education at the University of Augsburg, which she completed successfully in 2001. She then started out on a full-time academic career, initially being appointed to a position at the University of Augsburg (2002–2004) before teaching at the Free University of Bozen-Bolzano (2004–2006). She then became a research fellow at the Chair of Education/Primary and Pre-Primary Education at the University of Passau, before accepting a position as Akademische Rätin (lecturer) at the Institute of Primary Education Research at FAU in 2007. She was offered a position as a professor at the University of Koblenz-Landau, which she rejected in favour of FAU. Since September 2010 she has been the Chair of Primary Education and Teaching Methodology I at FAU, where her focus lies on ‘Teaching and Learning’. Professor Kopp was a member of the cooperative doctoral programme ‘Education as a Landscape’, which FAU is involved in together with the University of Bamberg, the Technische Hochschule Nürnberg and the Evangelische Hochschule Nürnberg. Her research focuses on dealing with heterogeneity and inclusion, as well as on teaching and learning in science and social studies in primary education. She also investigates transition periods in primary school and ways to encourage the related personal development of students, as well as exploring ways to tackle educational disadvantages and improve the quality of teaching in primary schools. Professor Kopp is a member of the Subdivision Primary Education at the German Educational Research Association (GERA), participating in the working group for encouraging new talent. 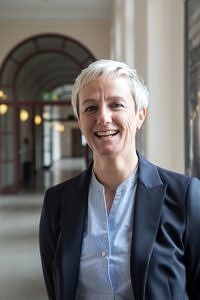 In addition, she is a member of the Society for Teaching Science and Social Studies (Gesellschaft für Didaktik des Sachunterrichts – GDSU) and the Society for Empirical Education Research (Gesellschaft für Empirische Bildungsforschung – GEBF). She is also a member of the working group on inclusion in the conference for primary school education and teaching at Bavarian universities, sometimes acting as a spokesperson. In an administrative role, she is responsible for representing research staff at the University in the committee for the allocation of tuition fee compensation and DFG overhead funding as well as in her position as Vice Dean for the Faculty of Humanities, Social Sciences, and Theology at the Regensburger Straße campus in Nuremberg. She has been Vice President at FAU since 1 April 2018. Her term of office ends on 31 March 2021.